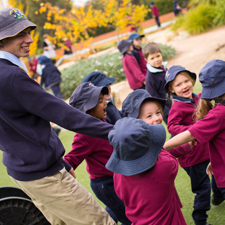 The first Code of Ethics for the Australian early childhood profession was developed in 1988; it was widely cited and used for 19 years. The first review of the Code of Ethics began in 2003 with the second version launched in 2007. The second review of the Code of Ethics began in 2014 with the third (current) version approved by the ECA National Board in February 2016. ECA is grateful to everyone who has contributed to the development and ongoing review of the Code of Ethics including those who have participated in consultation surveys, forums and workshops over the years as well as those who have provided advice and oversight through their service on reference and advisory groups. We would particularly like to acknowledge those engaged in writing each version of the Code. This Code of Ethics is informed by the principles in the United Nations Convention on the Rights of the Child (1991) and the Declaration on the Rights of Indigenous Peoples (2007). The Code of Ethics is an aspirational framework for reflection about the ethical responsibilities of childhood professionals who work with, or on behalf, of children and their families. In this Code the protection and wellbeing of children is paramount and therefore speaking out or taking action in the presence of unethical practice is an essential professional responsibility. To order printed copies of the Code of Ethics brochures and Code of Ethics A1 posters please visit the ECA shop.